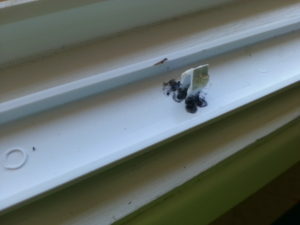 Here is why I broke the trim on the refrigerator. Or rather, here is what I was doing when I broke the trim on the refrigerator. Why I broke it is, well, ok, where was I? 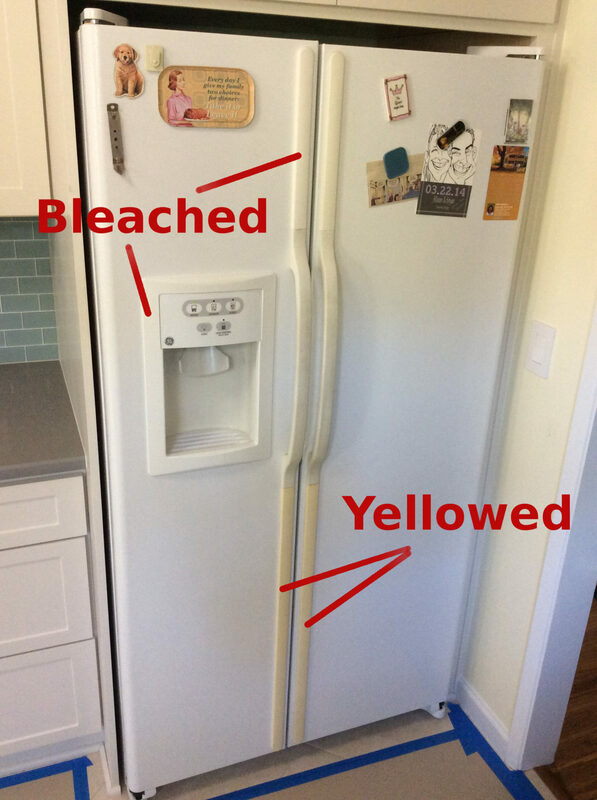 The white trim on the white fridge had yellowed over the last 10 years. 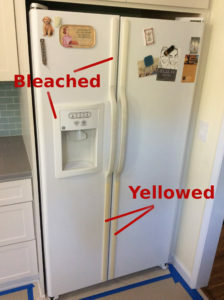 I happened to have read in the past about people restoring old ABS computer cases and video game consoles with some sort of bleaching process involving a “RetroBright” glop product, or a hydrogen peroxide and who-knows-what lethal concoction you can make in your own science lab at home. (You know those nerds and their projects! Heh heh! Ahem.) Which of course I could do, but I was feeling lazy and I wanted instant gratification. Fortunately, Dr. Youtube quickly educated me that in these modern times all I really need is some hair bleaching peroxide cream and UV light. I already had my UV light source ready at hand, powered by my fusion reactor conveniently stored at a safe distance of 93 million miles, readily available now that IT’S FINALLY FREAKIN’ AUGUST ALREADY!! ABOUT TIME WE GOT SOME SUNSHINE!! GOSH!! Sorry, a little Seasonal Affective Disorder lag in the Pacific Northwest; now back to the story. A short trip to Sally Beauty Supply store and $3 got me a bottle of “40 volume peroxide cream 12%” and now I’m beautiful! Er, I mean, now the trim on the fridge is beautiful again. Slop on the peroxide cream with a brush, put it in a clear plastic bag, and sit it in the sun for a few hours. Et voila! It worked. One of the pieces was ABS, and one was polypropylene. The bleaching process worked best on the ABS, but the polypropylene worked pretty well also. One theory is that the bromine added as a flame retardant is what turns the plastic yellow. Something sure was retardant. But regardless of the cause, the bleaching worked and it looks much better now. Just a few more trim pieces to break off, I mean remove carefully, and the fridge will look good as new. And stylin’ with its new ‘do ! 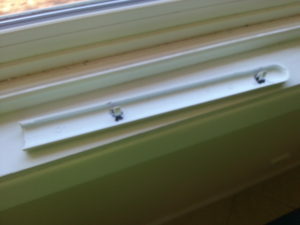 I just won’t use the hammer and block of wood to remove the other trim pieces like I did the first ones. Hey, Dr. Youtube showed me how to easily slide them off. Mine was just a little stuck. Where’s that bigger hammer? The doc just didn’t clarify it was for a different model. Hmmph! Anyways, if you have any white plastic that has yellowed over time, this really did work well to restore it; give it a try! Oh, and the broken trim pieces? Fixed with spin welding! I took a piece of plastic trim off of the refrigerator door, and the snap tabs broke right off. Dang it! The piece was marked PP, polypropylene, which just can’t be glued. So I used spin welding to reattach them. I cut a thin strip from a plastic lid marked PP and chucked it in the Dremel. Spun it up and worked it into the fillets. Friction melted it right in there, welding the tabs back on. I put it back on the door and the tabs are holding on tight. Perfect! In capitalism, man exploits man. But in communism, it’s the other way around!